Adventuring Beyond A Course In Social Studies Class 7 - Adventuring beyond, aims to develop skills that will help learners seek harmony in the diversity of the world around them, encourage learners to blaze new paths, and have a learning experience that goes beyond. Adventuring beyond is a Encyclopedia Britannica series of three social science textbooks for Classes 6,7, and 8, covering History, Geography, Social and Political Life. 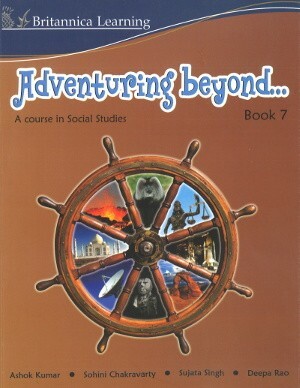 This series is an extension of the Adventuring beyond Social Studies series for Classes 1 to 5. Conforming to the National Curriculum Framework, 2005 and designed according to the new NCERT Upper Primary syllabus, 2005, Adventuring beyond is comprehensive and revolves around ideas and themes drawn from History, Geography, Civics, Economics, and Sociology in a balanced manner. Suitably graded, the series develops the social, cultural, and analytical skills required to adjust to an increasingly interdependent and diverse world. Variety of activities, experiments, surveys, and craft activities to learn while doing. Teacher’s book and teacher notes to assist the teaching process. Specific CCE icons alongside exercises and assignments indicate skills for evaluation through continuous and comprehensive evaluation (CCE). Adventuring beyond… aims to develop skills that will help learners seek harmony in the diversity of the world around them, encourage learners to blaze new paths, and have a learning experience that goes beyond.